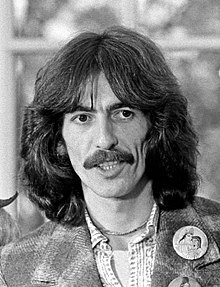 George Harrison, MBE (25 February 1943 – 29 November 2001) was an English musician. He was born and grew up in Liverpool, England, and was first famous as a member of The Beatles. After the group broke up in 1970, he had a solo career. He made many albums and worked with other musicians including Eric Clapton, Bob Dylan, Phil Spector, Roy Orbison, Tom Petty, and Ravi Shankar. He was also interested in Eastern mysticism and charitable causes. George's best-known album was All Things Must Pass, which he made just after the Beatles broke up. Harrison owned a mansion in England called Friar Park, where he lived from 1970 until he died. He built his own recording studio inside the mansion, which for a time was better than Abbey Road Studios, where the Beatles had made their records. Having a private studio meant Harrison could work on songs and recordings anytime he wanted. Ravi Shankar came to Harrison during 1971 with news about a war in Bangladesh, where thousands of people had died and millions more were refugees and starving. Shankar asked for Harrison's help to give a benefit show to buy food for them. Harrison called on many of his musician friends, who put together an all-star charity concert to help the refugees. The Concert for Bangla Desh, a live recording, became a best-selling album, raised money for the refugees, and brought worldwide attention to the problems in their country. It also inspired later benefits, including Live Aid in the 1980s. Harrison found a new musical partner in the 1980s, when Jeff Lynne of Electric Light Orchestra began to write and record songs with him. The two men worked well together and became close friends. Harrison and Lynne formed another band, the Traveling Wilburys, with fellow musicians Bob Dylan, Tom Petty, and Roy Orbison. The Traveling Wilburys recorded two albums, which became hits. In 1966, Harrison married a model, Pattie Boyd, but they were divorced in 1971, and had no children. Boyd left Harrison to be with his friend, guitarist Eric Clapton, but all three remained friends. Harrison married again in 1978, to American-born Olivia Trinidad Arias, who had worked for his record company. Arias became the mother of Harrison's son Dhani, whose name is comprised of the names of two notes in the Indian music scale. Dhani grew up to be a musician like his father, fronting the band thenewno2. He went to Brown University in the United States. In the late 1970s Harrison formed a movie production company, Handmade Films, which produced movies including Monty Python's Life of Brian and Terry Gilliam's Time Bandits. The grounds of Harrison's home, Friar Park, had been more or less open to the public, until the murder of his former bandmate John Lennon late in 1980. Harrison was very hurt and shocked by Lennon's death, and was afraid someone might try to harm him or his family. Afterwards, the gates were locked, and no-entry notices were posted. In December, 1999, an intruder broke into his home, stabbing him with a knife. Harrison and his wife Olivia stopped the intruder and called the police. Harrison recovered. The man who attacked him is schizophrenic and was acquitted of attempted murder by reason of insanity in November 2000 at Oxford Crown Court. He was sent to a mental hospital and released in 2002. In the 1990s, decades of smoking cigarettes caused Harrison to develop throat cancer. He later developed lung cancer, which caused his death in 2001. His family issued a last statement from him: "Everything else can wait, but the search for God cannot wait, and love one another." Even music was not as important to Harrison as his wanting people to learn to get along with each other, and to make the world a better place. A year after Harrison's death, Jeff Lynne, Dhani Harrison, the two remaining Beatles (Paul McCartney and Ringo Starr), and other musicians held the Concert for George, which remembered Harrison's music, his life, and his gifts to humanity. All the profits from the concert were given to charity. ↑ Hear George Harrison (music and interviews) on the Pop Chronicles (1969). This page was last changed on 16 April 2018, at 19:07.